Sharjah: After six days of trekking and climbing in the kingdom of Morocco, 13-year-old Asmaa Al Qayedi, has established herself as the youngest Emirati girl to have summited the highest peak in all of Maghreb. Tokubal, the tallest peak in the Atlas Mountain Range, has an elevation of 4,167 metres. In a special ceremony held on Thursday, Sajaya Young Ladies (SYL) of Sharjah, who organised the expedition, honoured all 11 of its young members who were part of this adventure. The journey took the girls on a trek through Marrakesh and the village of Imlil, before they began ascending Toubkal in southwestern Morocco. Asma, who was also the youngest member of the Sajaya team on this climb, has given the UAE a new achievement in the field of women’s sports. 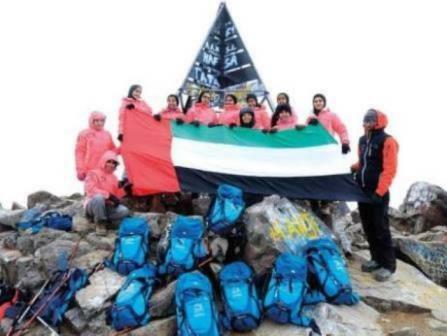 Upon reaching the summit, the young mountaineers cherished a proud moment for their organisation and their country by hoisting Sajaya and UAE flags on the Tokubal peak. “In organising this expedition, our aim was to build the first Emirati girls’ team specialised in hiking and mountaineering, in line with our vision to promote awareness of the importance of sports for girls, increase their abilities to discover themselves and achieve their goals, and focus on their holistic development by offering them unique and innovative avenues of exploration and creativity,” said Shaikha Aisha Khalid Al Qasimi, Director of Sajaya Young Ladies. The six-day expedition organised by the adventure club of SYL, took place from April 20 to 25, and saw a team of 11 girls in the 13- to 18-year age group participating. As part of their preparations, they underwent intensive training and climbing challenges including the wall at the Sajaya Sports Complex, mountain climbing in the Shoka Valley, kayaking in Hatta, and a mountain challenge in Wadi Galila. The honouring ceremony was attended by Shaikh Saqr Bin Mohammad Al Qasimi, Chairman of Sharjah Sports Council; Shaikha Aisha Khalid Al Qasimi, Director of Sajaya Young Ladies; Waleed Bukhatir, vice-chairman of Sharjah Chamber of Commerce and CEO of Bukhatir Group; Lau Samuel of Kingston Management; and famous Emirati adventurer, Saeed Al Ma’amari.